The only supported way to deploy Crystal Reports XI applications using the Report Designer Component (RDC) is using merge modules. In this document is described how to make a Windows Installer based setup package, that does nothing more or less than installing the Crystal Reports XI runtime to run a VDF 11.1 sample report. I have used the following tools: Crystal Report XI Developer Edition, updated merge modules, Orca and Installer2Go. For developing RDC based applications you need Crystal Reports XI Developer Edition or Crystal Reports XI for DataFlex. Both versions copy the necessary deployment files on your PC. CR XI for DataFlex includes the Connectivity Kit for Crystal Reports, that supports native DataFlex files. Business Objects put all the necessary files and settings for the Crystal Reports XI runtime in merge modules. Merge modules are components, that can be included in Windows Installer based packes. Crystal Reports XI needs the license keycode to be included in the installer, so I isn't possible to convert somehow the four merge modules into one installer. Updated merge modules are available at http://support.businessobjects.com/fix/merge_modules.asp. Copy these files to C:\Program Files\Common Files\Merge Modules. Orca is a Windows Installer package editor provided as part of the Windows Installer SDK. You will find it by looking for PSDK-x86.exe in Google. The title of the download site is confusing: "Windows Server 2003 SP1 Platform SDK Web Install". 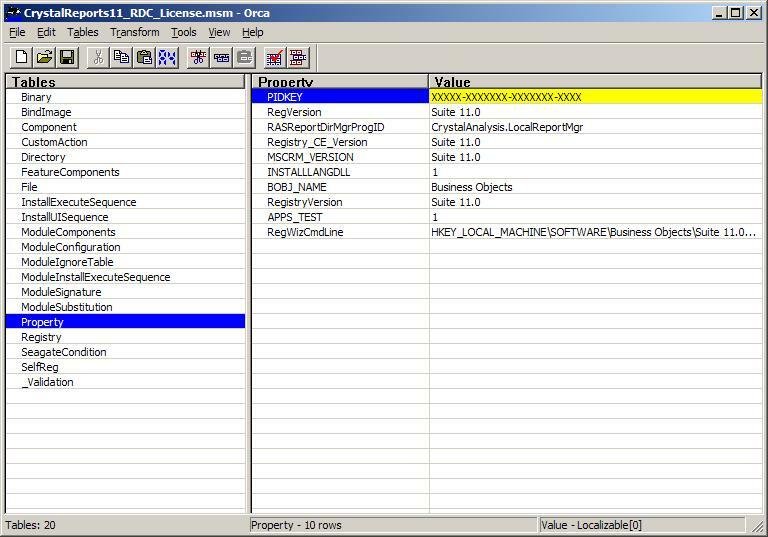 When you install PSDK-x86.exe you will find Orca.Msi at C:\Program Files\Microsoft Platform SDK\Bin. Install it and you will have a shortcut to Orca.exe. 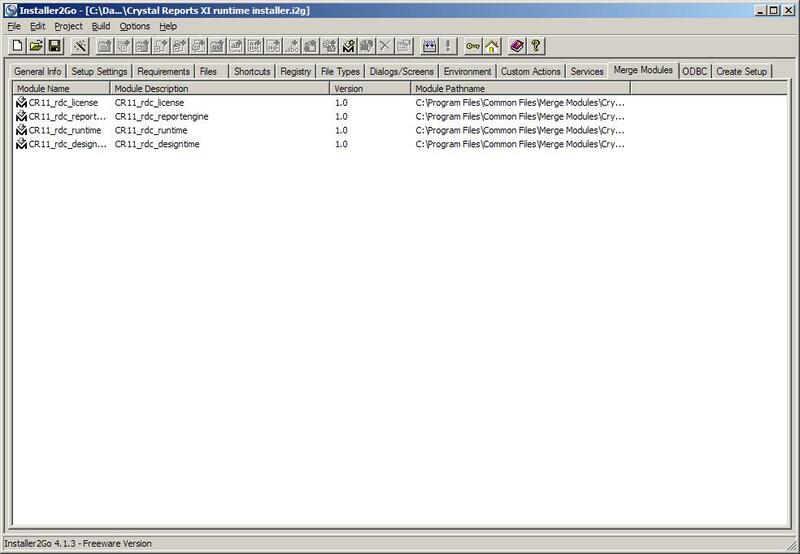 With Orca you can open the file CrystalReports11_RDC_License.msm. It is tempting to change everything that is possible, but it might be better to change just one thing: the license keycode. In the left pane you can choose for property and in the right pane you can set the value of PIDKEY. This isn't the serial number, but the code with the format XXXXX-XXXXXXX-XXXXXXX-XXXX. Orca saves the code in the merge module. Now that we have saved the license keycode in the merge modules, we can use any Windows Installer based tool. Installer2Go can be used as freeware version as log as you accept an advertisement page for SDS Software when the installation is complete. A single license only costs $ 49.00. Installer2Go is very complete, but you can still make simple installer packages. You can find it at http://dev4pc.com/installer2go.html. Under the tab Create Setup you can choose to create a self-extracting executable file. All these settings can be seen in the file Crystal Reports XI Runtime.i2g. 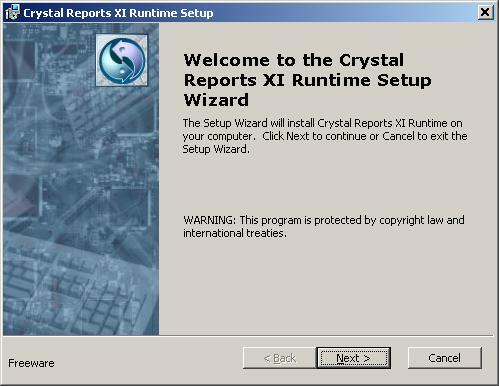 The end result is the installer Crystal Reports XI Runtime with a size of more than 70 Mb. Leaving away several option (export filters, etc) doesn't result in a smaller size. The installer doesn't include the Connectivity Kit for Crystal Reports. If you want to test a report, take the report "Crystal - Address Labels in the orderentry sample of Visual DataFlex 11.1.